If you finish reading this article and wonder why Peter titled it so, think again- you've missed the joke- I did. I am a newcomer to the black arts of vintage tractor restoration, having purchased a 1952 Ferguson TED-20 some months ago. 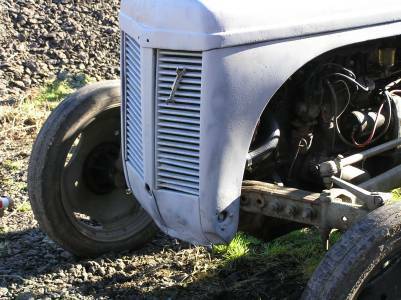 When purchased, the tractor appeared fairly complete, with most of the tinwork intact under the most bodged-up paint job imaginable, a sort of scabrous mixture of grey and red. Clearly, somebody at some stage had tried to make it look like a FE35, as the headlights were mounted on top of the bonnet, and the tinwork had been painted red, even including the fuel tank. A coat of grey had then been applied over much of the red, not a gloss finish but looking rather like a sort of grey metallic anti-fouling paint for boats. The engine was totally asthmatic, difficult to start and liable to strangle itself when revved up. This proved easy to cure, as some kind person had fitted a Morris 1000 type distributor with vacuum advance-retard, fitting the correct distributor and cleaning out the entire fuel system made a world of difference. It was now possible to run on petrol, but not on TVO as the engine would not warm up. This, I assumed, was a faulty thermostat, and there was no heat-shield fitted so this was pushed back down the ‘to-do’ list. What became rather more pressing was the inability to get the gearbox to go into 4th gear. Everything else worked, even the hydraulics, and after a few tries even the stick-starter began to work, but the gear lever refused to go into 4th. Fellow Members of the Severn Vale Vintage Club debated, argued and speculated over the problem. One doubted it had a 4th gear, but a quick run in 3rd with a hand-held GPS unit from my Land Rover established a speed of 6.8 mph, exactly as per the manual. At least it proved the governor was OK! Several Members suggested that because of the totally smooth rear tyres, some sort of mechanical block had been added to limit the speed. Eventually two colleagues and I grasped the nettle and began to strip the box. It says a lot for the design and construction that the gearbox would operate quietly, and the hydraulics function normally, with a few pints of milk in the bottom of the casings. The gears even appeared to be in good condition, but would still not go into 4th. Eventually the casing was split and the shafts removed, and at last the cause of the problem became clear. Wedged securely in the front lower part of the box were two spanners. One was still free, the other had wedged in the casing with one end partially chewed off, although no gear damage could be found. Further evidence of workmanship could be found: somebody had hammered the selector rods in with a sledge-hammer, so they had to be re-ground circular before re-assembly. The gearbox is now re-assembled, minus spanners, and with new radiator hoses and with a thermostat fitted we hope it will reach normal operating temperature. At least it can be said to be fit for road-runs now, as Secretary of the Club I have had a lot of stick about that all Summer! !